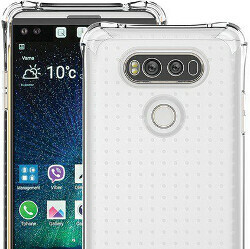 The LG V20 is just a couple of days from its grand unveiling, and after the lackluster sales of its flagship G5, the company will be looking to make a big statement. Despite a consensus of indifference, it has been suggested that the modular aspect of the G5 could once again be deployed with the forthcoming phablet. According to a new report on the matter, though, the V20 will not offer support for LG's fleet of Friends add-ons. But the story doesn't quite end there. 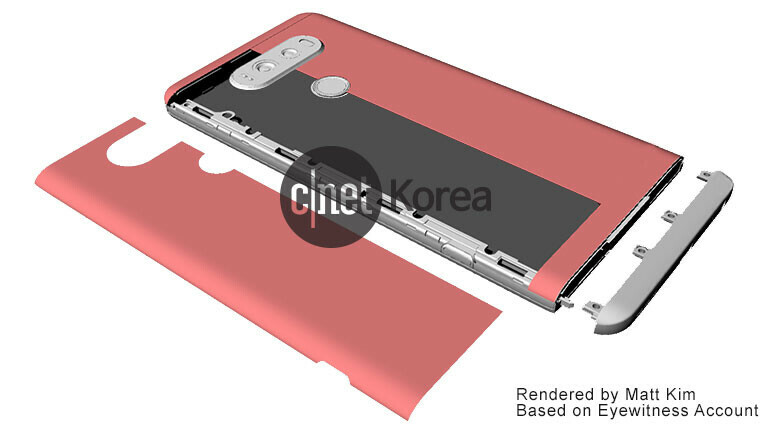 According to a report from c|net Korea, the V20 will include a rather quirky, slide-out compartment on the left side of the device's rear. By the touch of a button on the edge of the device, a door opens to reveal the (presumably removable) battery, along with SIM and microSD slots. The report includes a handful of renders to illustrate the device's idiosyncrasy. Keep in mind that the images are based on an eyewitness account, so are in no way official or necessarily representative of the final product. While the renderings do appear to suggest that the bottom part of the device will also be removable, the accompanying report hastens to add that this will not be the case. This isn't the first time that such a sliding mechanism has been seen in the smartphone industry. As you may recall, the HTC Desire HD included something very similar. It remains to be seen if this feature will have any impact on the company's flagging sales. The South Korean firm's first attempt to bring something new to the table this year did prompt quite a bit of initial excitement. But while it seemed like people were tripping over one another to praise the modular marvel right after the unveiling, sales didn't live up to the fanfare. Looking at the V20's rumored list of features and specs, it strongly emanates a device with a point to prove — not that this is necessarily a bad thing. The device, which briefly got some airtime in a recently-leaked video, looks set to pack a 5.5-inch QHD display, Snapdragon 820 SoC with 4 GB RAM, 64 GB of expandable storage and a baked in, 32-bit Quad DAC chip for audiophiles. It's also confirmed as the first handset to launch with Android 7.0 Nougat out of the box, and based on today's evidence, the purported 4000 mAh battery will be removable. The gallery below showcases the sliding mechanism. As noted earlier, the renders are based upon an eyewitness account, and should only be considered a guide as to the new feature. Take a look, and be sure to share your initial thoughts in the comments. Still it will be flimsy and tacky. If they want to take ques from other sources, where it has sliding mechanism with with 4 strong neodymium magnets. So it stays super intact. dude..shut up. Hold it in your hands before you talk. Can't wait to get my hands on this beast! Good a much convenient way . Hope they dont ruin it again with that earlier bootloop and horrible lg g5 light bleedproblem .Now lg ball is in ur court u better score it right. I like your sense of humor. If ya may - would ya say hello to Steve Irwin for me mate? Love the 4000mah . Leave the same design as V10, then definitely interested in. Design is the most ugly part of v20. V10 was a really beauty. I'm definitely in love with the secondary display concept, which, IMHO is WAY better and productive (not to mention power efficient) than Edges and AODs (Always On Display, duh!)... But that's just me... V'Day! It's a tough crowd here, Agent Zero... Not pointing my finger at anyone or anything, but around here, you'll meet more Sammy Fanboys than anywhere else... I wonder why these folks don't hang around on Samsung Forums...? Is it about bragging rights? Or... Is it about inferiority complex? Well, I'm letting you be the judge of that...! But whatever the reason may be, People should keep an open mind when it comes to smartphones... Anyhow, V'Day! Why don't you hang around on Apple's, since you secretly love and admire Apple. But you claim not too, because you will be called and poked at. Very smart old guy you are. Nah... Not Very smart, just slightly above average at 120 IQ... But that was a long ago, now I doubt I'd be able to break the 100 I.Q barrier... Anyhow, do I admire iPhones? Yes... But not ' secretly' as you're trying to imply... As many know, I also love Nexus and Windows Platform... Same about Blackberry OS, specially BB10... Am I still biased...? Well, think what you want, mate... We live in a democracy, after all...! V'Day! @Agent Zero Right on man! I guess water proofing is most definitely out the window with this rumor. Not that anyone said it would be water resistant though. Since when is one add on a "fleet"? Too bad. Modularity had a ton of potential. I hate to see them abandon it so quickly. Had it been thought out, modules never would have been entertained as anything beyond a few niche items. Simple CSFT. Google gets involved though and people go out of order. First they wet themselves and then they drink the Google-Aid.